Wilsonart is well known for it’s countertop materials such as laminates, solid surface & quartz. 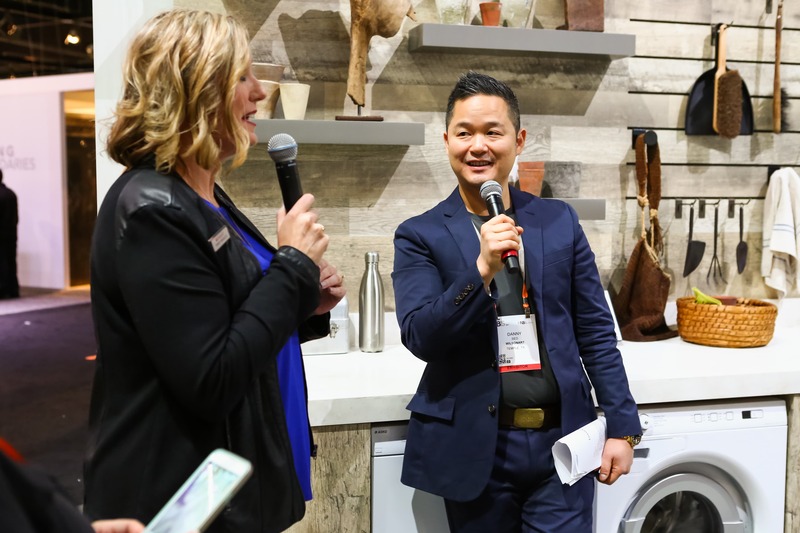 But at this years Kitchen and Bath Industry Show (#kbisblogtour) it was the laminates that were getting so much of the attention! Watch my video to see why. Danny Seo was at the show as a spokesperson for Wilsonart and I had the opportunity to see him speak and to get a signed cookbook. I will have to give that to my husband because he does most of the cooking in our house! Danny says he coined the phrase ‘Materials Mixology’ which paired up nicely with Wilsonarts’ tagline: ‘Explore New Surfaces’. If you look closely, behind Danny is a vignette they created on the show floor. Watch my video so you can see exactly what products were used and why we designers were all buzzing about them! !